starting from the Enchoen Roadside Station in Yurihama. Pre-registration has ended, but it’s not too late to join in the fun! 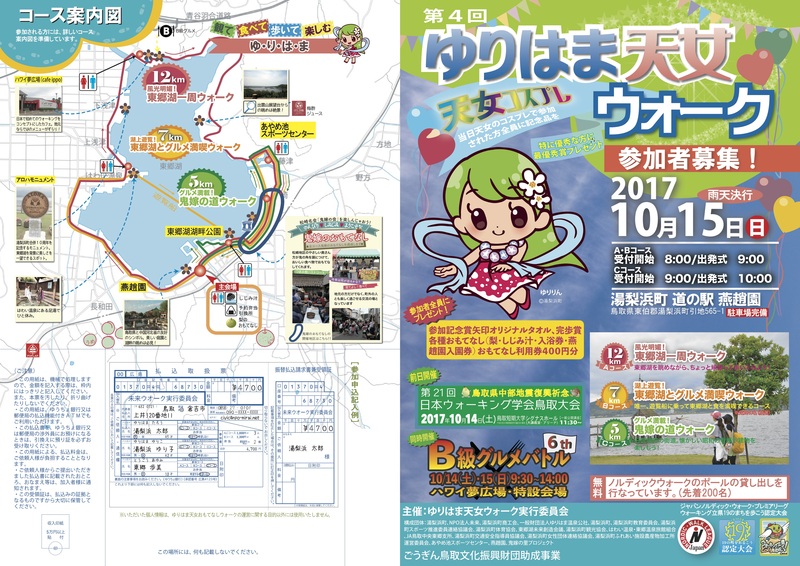 Course A offers a scenic 12km trek around Lake Tōgō, while Course B is a 5km walk offering a chance to enjoy some local treats. Course C is a 3km walk especially aimed at families! Each named for one of the seven gods of good fortune, there are 7 chloride sulfate hot springs footbath (足湯 ・ashiyu) locations found around the perimeter of Yurihama’s Lake Tōgō. Visitors can relax and soak their feet while conversing with friends, making new acquaintances, getting lost in a good book, waiting for their onsen tamago to cook, or simply enjoying the scenery. Recommended for anyone who may be a bit hesitant to undress in front of others but who wants to take advantage of the Japanese onsen experience, all footbaths are free to use and are open year-round (except during maintenance and weekly cleanings). Found in Yurihama’s Megumi no Yu Park, the Hotei no Yu (Megumi no Yu) not only offers a beautiful view of the lake, but visitors can also enjoy making onsen tamago at this location (you should let the eggs cook for about 25 minutes). This footbath is also popular with the locals, making it the perfect spot to meet and chat with the local residents! Yurihama’s Shitori Shrine was an important shrine of the Hōki Province and is said to enshrine the goddess Princess Shitateru, who was known for both her beauty and intelligence. As such, the shrine has become known as a power spot for women seeking to increase their feminine charm or find a good match. As you head towards the shrine, you will also find the “Anzan Iwa,” which is a large boulder said to answer prayers for safe childbirth. While you’re there, don’t forget to get your Kahori Bukuro, which are cute and fragrant protective charms sold at the shrine. You should offer one of these as you pray at the shrine and keep the other with you to bring about the blessings of Princess Shitateru. This blend of pink and red roses enhances the holder’s beauty and grace. This blend of rosemary and marigold brings about rejuvenation and spiritual rebirth. This blend of orange peels and marigolds is said to help bring the kindness and warmth of Princess Shitateru to the holder. This onsen hot springs footbath is found on the shores of Lake Tōgō. You will know you found the right place when you see a monument of two koi (carp). It is said that lovers should touch their feet to the bottom of the statue to solidify their koi (love). Couples wishing for a child could then pray to the nearby Jibo Kannon (Loving Mother). According to legend, you are supposed to pray from the right side of the statue for a boy and from the left for the girl. For everyone with someone special, there are many wonderful cafes and restaurants to enjoy in Yurihama- not to mention the beautiful and romantic sunset over Lake Tōgō! On 16 October 2016, Yurihama hosted the 3rd annual Yurihama Celestial Maiden Walk (天女ウォーク) in conjunction with the 6th annual World Trails Conference held in the Tottori Prefecture of Japan. 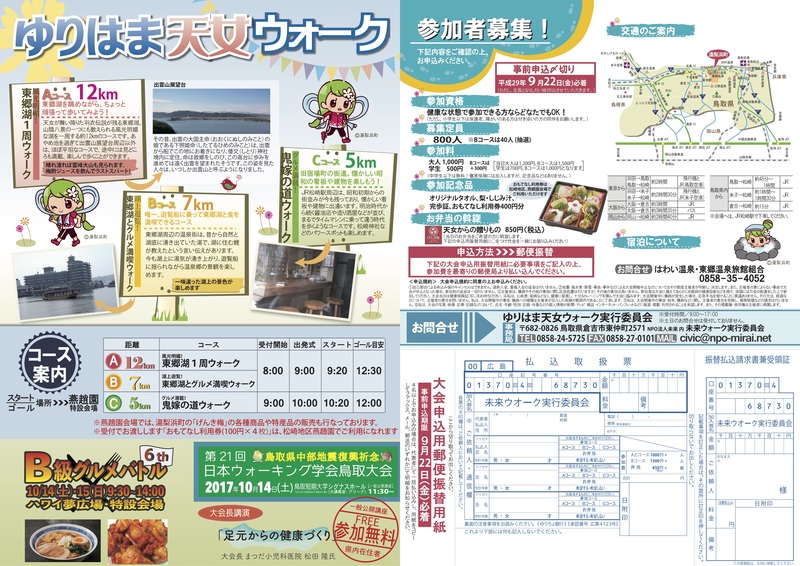 There were 3 different courses available, including the 4km Laid-Back & Lively Walk (らくらく＆わんぱくウォーク) especially for families and young children, the 5km Lake Togo & Retro Streetscape Course (東郷湖とレトロな街並みウォーク) for those wanting a comfortable and refreshing walk, and the 18km Lake Togo & Mt. Uma Walk (東郷湖と馬ノ山を巡る道ウォーク) for those looking for a challenge and the chance to really experience the history and natural beauty of Yurihama. In total, there were approximately 870 walkers who participated, with an additional 40 who took part in a special tour course held the day before. The departure ceremonies were kicked off with a hula performance by local hula group Friendship Hawaii as well as remarks by Mayor Masamichi Miyawaki. Those participating in the 4km and 5km walks were treated to a special appearance by Olympic gold medalist Mr. Kenji Ogiwara (who also joined in as a guest walker), governor of Tottori Prefecture Mr. Shinji Hirai, and Japanese actress Ms. Miori Takimoto. There were pear-tasting stations, a ground golf hole-in-one game, and various shops and vendors set up as well, creating a fun and festive atmosphere. Participants were invited to try shijimi clam miso soup, made using the large shijimi clams from Lake Togo, ogre-shaped sweets made by the Oniyome Demon Bride Association, and much, much more!